“The Dark Knight.” “Spider-Man 3.” “New Moon.” Say what? Well, bite me. That little vampire movie grossed more than $140 million over the weekend, making it the biggest opening of the year and the third biggest of all time (behind the other two movies named in this blog’s title — both of which, it should be pointed out, opened in the busy summer season). “New Moon” also racked up the biggest opening day in movie history (Friday alone made an estimated $72.7 million, compared to $67.2 million earned by “The Dark Knight”), and more than doubled the opening-weekend totals for its 2008 predecessor “Twilight.” Variety reports this morning that all of this is shaking up the movie industry, which has long believed that big-box-office movies have to be aimed at fanboys or families, not young women. (Hey, don’t they remember “Titanic”?) 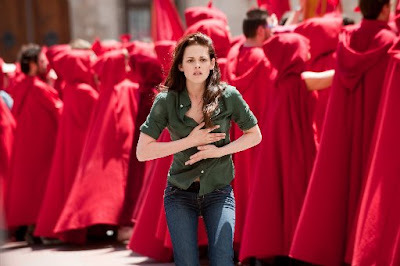 50 percent of the women attending “New Moon,” the story points out, were under 21. As we ponder the fact that “Eclipse,” the third “Twilight” movie, will open during the peak of the summer movie season next year, and wonder whether Robert Pattinson, Kristen Stewart and Taylor Lautner will spend the rest of their careers trying vainly to prove that there’s more to them than moody sparkle-skinned vampire, surly girl-in-crisis, and cheery teen werewolf respectively, let me ask this: Did you go this weekend? I went Wednesday (to the premiere screening) and noted that Team Jacob screamed much more loudly than Team Edward, and that, in a move that should warm the hearts of studio executives, a huge roar of approval was given to the Summit Entertainment logo at the beginning of the movie. But I wasn’t at the multiplexes this weekend. Any good “New Moon” stories out there?